I’ve had a passion for reading, writing, and art, ever since I can remember. Although I’m still very new to the business, I would describe myself primarily as an illustrator/artist. I work a little bit behind the scenes for Sekhmet Press, also doing some editing, which I find strangely satisfying – possibly because I can never seem to stop compulsively editing everything I hear or read in my head. In the future I would like to also someday publish some of my writing. So far I’ve been drawn to working on strange, dark, and surreal pieces. I love anything that lingers in my mind, especially in that twilight between consciousness and dreams. That’s the feeling I want to try to capture in my work. That being said, as I mentioned, I am still very new to the fiction world, so there are still many genres I would like to explore. I think romance illustration could be scandalously fun, for example. Do you moonlight as a man? Why/why not? I never have used a male pseudonym, and currently have no plans to do so in the future. It’s possible I may decide to give it a try as an experiment one day, to see what kind of different audience my work would attract based on a difference as small as a name. Neil Gaiman is my hero. Especially for his novel American Gods, and his graphic novel series The Sandman – which is also worth checking out for the stunning artwork by Dave McKean and a host of others. I can’t even begin to explain why and how much I love this stuff without dissolving into a rambling mess of rabid enthusiasm. If you haven’t read them, please do. Recently I’ve also been enjoying George R. R. Martin’s epic fantasy saga, A Song of Ice and Fire. I have to admit I am slightly embarrassed to confess to loving something so mainstream and trendy at the moment, but fantasy was what originally made me fall in love with reading as a child. I remember spending hours and hours on end as a little girl curled up with C.S. Lewis’s The Chronicles of Narnia, Brian Jaques Redwall series, and later on the Harry Potter books by J. K. Rowling and J. R. R. Tolkien’s Lord of the Rings. As an adult, I don’t think I’ve ever fallen into a fantasy world the way I remember being affected by those books as a child, until I started reading ASOIF when I was suffering withdrawal after the second season of HBO’s A Game of Thrones ended. The biggest piece of advice I would give my younger self is not to get intimidated by perfectionism before even starting a project. This is still something I struggle with – I have a hard time even starting anything without feeling completely sure that I have enough time, all at once, to complete it to my standards. There have also been so many times I’ve completely scrapped something I’m working on because it doesn’t look perfect when it’s only 10% complete. When I can listen to the rational part of my mind, I know that work evolves on the page. Nothing starts out perfect. Unrealistic expectations just hold you back. 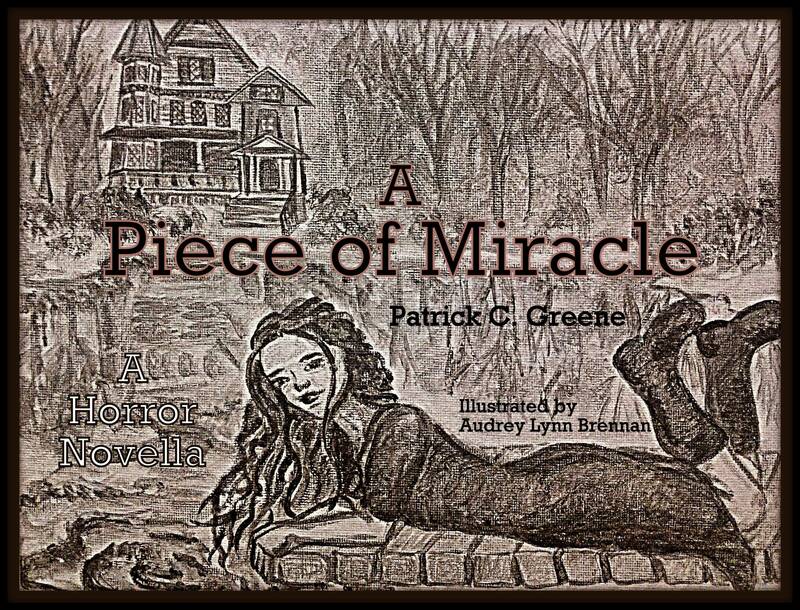 I’m really excited about the upcoming horror novella I’m illustrating, A Piece of Miracle by Patrick C. Greene. (you can see a test cover below) Look for it this Fall. In addition, I’m currently growing a real live human being in my guts – coming out in early May! I’ve had a love affair with all things creative throughout my whole life. As a kid, I was a total bookworm. I’ve always had a passion for painting and drawing as well, and in high school I attended a magnet school for visual and performing arts, where I became heavily involved in theater and dance. I studied fine art and illustration in college, and now work as an editor and illustrator for Sekhmet Press with the amazing Jennifer L. Greene. I hope to transition to that being my full time job, but presently I must confess to still bartending part time to pay the bills. Sharing some special deals from our friends at Hobbes End Publishing! “Wrapped in Red is an anthology that includes not one or two great stories, but all thirteen stories in this collection are strong and well written. These vampires are old school, without a bit of sparkling in sight, for which I was truly grateful. From authors I love (i.e., Billie Sue Mosiman, Patrick Green, Suzi M and Chantal Noordeloos) to authors I’ve never read before, I enjoyed every story in this book. Just plain good old fashioned horror, well written, well edited and worth a read. When I was asked to review this by the publisher, I wasn’t really sure. But in the end, I sat down and read the entire collection in a day, so if that isn’t a collection worth a 5 star rating, I’m not sure what is.” Kat Yares Vine™ Voice reviewer. At six twenty-two p.m., Pooky yelped and leapt at the door, even before the doorbell rang. Rising from her rocker and her scrapbook project, Mrs. Edith Tucker shushed the Pomeranian. Answering the door for the first gaggle of trick or treaters, she expressed suitable delight at the pirate, the football player, the home-made mummy, and the two identical suburban princesses from some reality program that she had never watched. Pooky seemed satisfied, for the nonce, that there was no threat, and pranced back to his post at the foot of the old armchair. Beyond their masks and face paint, the children expressed grateful surprise at receiving the full-sized candy bars, the little baggies of popcorn tied with orange and black ribbon, andthe caramel apples with which Mrs. Tucker weighed down their bags. “What have I gotten myself into!” Mrs. Tucker-then known as Edith Urquhart- chuckled, as her date Edison, dressed cumbersomely in a furry Big Bad Wolf costume to her Red Riding Hood, practically dragged her into the Halloween party at his frat house. She’d never seen him so excited, and it occurred to her this might be the other shoe dropping; Edison’s kind and thoughtful façade giving way to a debaucherous weekend persona who engaged in typical college boy antics when a reasonable excuse presented itself. Later, she would admonish herself, upon witnessing Edison and his pals greeting each trick-or-treater with such enthusiasm and joy they inevitably left with grins evident beyond even the most concealing mask. There would be jump-scares from the bushes and behind furniture, but judiciously telegraphed so that no one was ever truly traumatized. The beer was left in the refrigerator; Edison and company were too busy handing out ridiculous amounts of candy. Leaving a designated brother behind, Edison had led the others, Edith included, on a mission along the outskirts of the campus to collect change for the local orphanage. She fell in love for the first and only time on that Halloween night, and never fell out. Mrs. Tucker watched as the kids shuffled off, feeling personally responsible for them till they reached the safety of the minivan waiting at the end of the drive. She waved at the pretty young mother at the wheel. As the van pulled away, Mrs. Tucker stood and listened to the sounds of the autumn evening. The drone of a truck faded on the distant highway and Mrs. Tucker heard the rustling of orange and red leaves, taking in the smell of fresh decay carried on the breeze. As this sound faded, Mrs. Tucker detected an odd new sound from the border of hedges to her right. At the edge of the yard by the road, the hedges shook slightly, long after the breeze had passed. A cat? Or Halloween tricksters, perhaps. Mrs. Tucker cleared her throat with just the proper timbre to show she was aware of…whatever it was. Still, she couldn’t help but smile a bit. In over thirty-five years living in Westbrook, she’d never heard of any truly troubling incidents out of the neighborhood’s reasonably well-heeled children. Mrs. Tucker pulled her shawl tight and stepped inside, back to her scrapbooks. By seven thirty-seven, several trick-or-treaters had come and gone. Pooky had settled into a routine of scampering to the door, huffing at each new band of invaders, then returning to the chair, perhaps expecting the return of his master, even after these three long years. Outside, as dark drifted down like a cold blanket, the streets bustled with activity; tricks, treats, laughter and squeals of faux fright. Standing at the door for a moment, as had become her habit after each band of Halloweeners, Mrs. Tucker felt a small yearning for the revelers to come closer, to run excitedly to the Tucker house as they had when Edison was alive. How he had delighted the kids with lively off-the-cuff spook stories, personalized for each group. Since Edison had passed, the Tucker house had become less popular with each Halloween. Mrs. Tucker had tried to keep the enthusiasm alive by stocking the best treats in the neighborhood. Rustling again, in the hedges? Pooky issued a nervous, plaintive growl. Mrs. Tucker listened, peering past the still-thin veil of night. At seven fifty-three, Mrs. Tucker opened the door to find a supremely cute four-year-old boy in a Frankenstein costume, chaperoned by his twelve-year-old sister who was half-heartedly made up in some sort of –what do they call it? Runt rock? Punk, that was it. A punk rocker, with green hair spiked up in the middle, and a vinyl dog collar. Or maybe it wasn’t a costume. “Hello, you sweet little monster!” Mrs. Tucker gushed, rubbing the boy’s head. His sister offered a sweeter smile than Mrs. Tucker expected, considering the girl’s disaffected affectation. Pooky remained quiet, offering only a perplexed look. The boy only had eyes for the candy, while his sister shot a quick, nervous glance toward the bushes. Mrs. Tucker stared hard at the line of hedges now drenched in darkness. “Maybe it’s just somebody playing a trick.” The little girl grabbed her brother’s hand and rushed him away, cutting through the yard in the opposite direction from the hedges. Suddenly, Mrs. Tucker felt very alone and very vulnerable. She turned toward Edison’s chair, knowing he wouldn’t be there, just like any of the several dozen times a day she did the same. Pooky had retreated to the kitchen doorway, staring first at Mrs. Tucker, then into the dark. When the front door was closed, he lay his head down upon his tiny paws and essayed a plaintive whine. Mrs. Tucker sat in her rocker till 8:40. She had planned to re-organize her scrapbooks tonight, perhaps hoping someone would ask her about the project, at which point she could show off her work, talk about her family, and have some company, if only for a precious few minutes. Looking up, she found Pooky at her feet, staring. Mrs. Tucker knew Pooky wasn’t hungry. His bowl was nearly full. Pooky suddenly barked his shrill, rarely-heard woof. Mrs. Tucker jumped with a start at Pooky’s outburst, tossing paper mementoes into the air in a confetti of panic. But Mrs. Tucker did not further admonish Pooky, glad to have the silence filled, even as her little companion snarled and scratched at the door. Mrs. Tucker approached the door, listening intently for whatever had upset Pooky, too afraid of silence to shush the little dog. Her curiosity betrayed her fear, firing synapses to open the door. Pooky quickly backed away from the doorway, growling. As Mrs. Tucker swiped at the light switch, she realized that it had been left on to encourage trick-or-treaters hours ago. Pooky stayed behind Mrs. Tucker, quieting long enough to sniff the air. He didn’t like what he smelled. Mrs. Tucker took a step back from the door, ready to slam it should, heaven forbid, an intruder attempt to rush in. There was movement at the bottom of the hedges, very close to the house. And a slick darkness on the grass. The movement stopped. Was something waiting? Mrs. Tucker eased the door shut fighting back the urge to call out for Edison. She looked around for Pooky, and found herself oddly lonesome in the dog’s sudden absence. Surely Pooky had merely gone to a safe dark place, perhaps under the bed or behind the commode. Mrs. Tucker made a quick check of these and other tiny sanctuaries, though her knees and hips protested violently. She found only wavy little hairs, not their source. She called and called, refusing to entertain the notion that Pooky might have slipped past her before she closed the door. Even so, Pooky would have barked and scratched in short order. Unless—-but no; Mrs. Tucker wouldn’t entertain an “unless” even for a second. Mrs. Tucker rolled her eyes at herself. How that must sound to the jaded ears of a police dispatcher on Halloween night. At precisely ten o’clock, Mrs. Tucker hung up in resignation, and stepped into the living room. She called out for Pooky, and made kissy noises. She had not seen Pooky go out. But Pooky was gone. The front door, even with its dead bolt and chain latch, was little more than a thin veil. Mrs. Tucker went to it, opened it. From somewhere, several blocks over, came delighted laughter. Children and their parents and those in between who loved Halloween not for the candy or the pleasure of seeing cute little costumed creatures, but for the dark freedom it offered, these revelers carried on with the abandon that Mrs. Tucker had always only allowed herself to observe. Edison, with his eternally adolescent humor, had always brought it much closer, close enough really, for this lifetime. But here on Tulip Street, where mostly old folks lived, the porch lights were already dark, and the indoor lights were reduced to just a television here or a nightlight there. The children in the neighborhood itself were all very respectful of their elders, God bless them. The wind rattled the leaves. Something else rattled the shrubs. Mrs. Tucker’s voice was barely audible even to her. Whatever was out there, taking its sweet time getting to the house, was smart. And dark. And inevitable. Maybe this thing would take her to Edison, and ease the pain that would not subside since she’d lost him. Perhaps it was Edison, playing a final Halloween prank before claiming her once more, for the world beyond. Pooky, she thought, might have already been claimed, and now she had only to allow the circle to close. Mrs. Tucker turned from the door, leaving it open. She pulled her shawl around her as October rushed in, and moved her rocking chair near the door. After a moment, she decided to turn it so that she would face away. Ready or not, she thought it might be best not to see her transporter, her emissary back to the shadows, even if it was Edison. At ten forty four, a tear rolled into the wrinkled corners of Mrs. Tucker’s smile, as she sensed something quieter than silence slipping in through the open door. She placed a photo of Pooky from his puppy days on the last page of the scrapbook, and eased it shut for the final time.